We met in college when I moved into a new dorm in January of my junior year. Chris was part of the unofficial Welcome Wagon, one of the curious men who wandered by what had been a convent-like room before my arrival to surreptitiously (not so very) check out the new girl. We made a brief attempt at romance that ended when I fell for a tall, skinny, nearly mute, blond-haired, blue-eyed alcoholic. (Oh, how I loved the type, but for the alcoholism.) Not my best decision. But once Chris got over it—which took an hour or two—we settled into friendship. It wasn’t until—on the heels of Three’s Company—Chris, Tammy, and I got an apartment together, that the friendship really flourished. Living in that apartment, we discovered our shared interest in sitting around smoking cigarettes and watching television while our classes went on without us several miles away on campus. We spent many hours together engaged in this activity—all day and into the morning, him in his rocking chair, me on the couch, a haze of smoke floating above us. We were buddies of the highest order, like Butch and Sundance, Starsky and Hutch, Stan and Ollie—just a whole lot lazier. We elevated doing nothing to an art form, whether it was in the apartment (and it usually was, since we had all but become one with the furniture) or at a bar. At the bars, we’d rate women as they walked by, as any guys would. Except I wasn’t a guy, not really, and I couldn’t keep girly feelings out of the picture. (Women!) Thank God he had better sense; I can’t imagine a bigger disaster than the two of us as a couple. We both derived too much satisfaction from seeing how high the pile of dishes in the sink could grow, were too amused by each other’s tales of surprise exams that wouldn’t have been surprises if we’d attended a class in the previous month, too impressed by ashtrays so crowded the butts would ignite. He and I would have been a mutant form of The Odd Couple, starring Oscar Madison and Oscar Madison. No checks and balances, all dessert and no dinner. Not even dessert—we would never have left the playground. We lived together just the one semester. Our friendship was never in that zone again, nowhere close. Somehow, we both grew up. He got married, I got married, babies were born, and we barely saw each other. Often years would pass without any contact. But in the past 10 years or so, we’ve discovered it doesn’t matter how long it’s been since we’ve seen each other. Because, though we may appear to be vastly different from each other, at some level, we’re the same. It’s not that we think about the same things, or have similar talents. It’s about perspective—seeing the irony and humor, noticing details small and ridiculous. Eh, why try to explain it? There’s a meeting of the minds, and that means we laugh a lot when we’re together and areas of our brains that have long been dark light up. I can’t speak for him, but I find comfort too in being understood, in the clairvoyance we seem to have into the other’s intended meaning. In recent years, Chris has made his unique view of the world concrete through his exploration of photography. No surprise: I find his work immensely entertaining. So I was excited when he told me he was going to be hanging a show at a café not far from my house, then not so very excited when he asked if I would help him. My boyfriend saw my face fall when it registered that Chris was inviting me not to a party but to a work session. 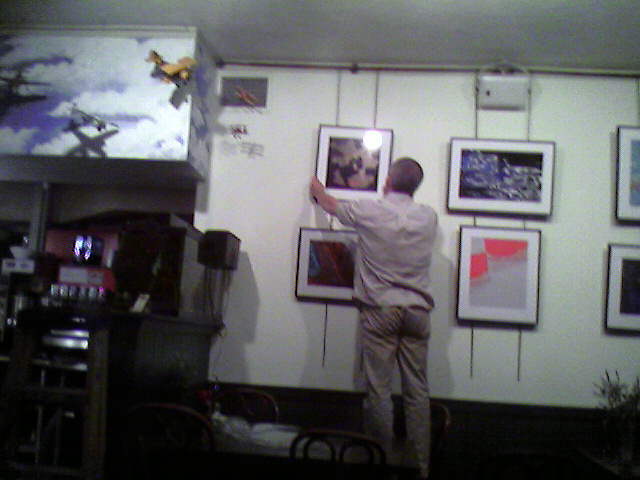 However, it turns out that hanging a show doesn’t have anything to do with placing pictures on hooks, which I gladly would have helped with once I got past the social letdown. (What? No party?) Hanging has to do with deciding what goes where, which photos to pair together, how high, how low, how far apart. Apart from a minor obsession with straightening paintings (true confession: the only venue where I can resist the urge is a museum—and I can’t even promise that’s true [bad pun, if you're clever enough to see it]), I’m a visual person. I love working with color and mise en scène (that’s the old-fashioned term for what most people now call feng shui) so helping Chris hang his photos turned out to be a bit like a party. Once we sat down to study the thumbnails and the floor plan, and Chris started to show me what he was thinking, I began to shiver with excitement because I knew exactly what to do and I was going to change it all(bwah hah ha)! I couldn’t wait to get my hands on those thumbs and play 52-pickup with them. Which I promptly did. But that didn’t turn out to be the fun part (as fun as I’m sure that sounds to a normal person). The fun began when the pictures started to go up. It’s been a long time since I’ve worked collaboratively. Sometimes I think I’m being collaborative only to find my opinion doesn’t really count, that I’m being humored and summarily ignored. And writing and editing at home alone lends itself to a give-and-take only with my own neuroses. But the thing is that, once upon a time, I dreamed of having a creative collaborator. I love seeing a concept tossed around like a wad of Silly Putty and reshaped with each hand that touches it. I would have liked to have written for television, say, with a team, and experienced daily the excitement of ideas raining down like a squall. Something like that happens occasionally when I’m by myself—a phrase flies off my fingertips and makes me laugh (almost as if someone else came up with it), and thoughts come so quickly I can barely think fast enough to capture them. It can be fun, but the laughter doesn’t echo as it does when playing with others. What made the collaboration with Chris so satisfying was trust. He asked me to help him because he thought I’d be good at it. So when I had an idea, he didn’t take it apart and criticize it, naysay or negate it. He trusted me enough to try it, and if it didn’t work, we agreed it didn’t and found another way. It took us an hour and a half to place 16 pictures and we worked without disagreement or dissention. At no point did I feel—did either of us feel—we had lost a battle or settled for something we really didn’t think made sense. I work in an environment in which the talents Chris appreciates in me are often overlooked and ignored, or my ideas simply vetoed. Having that in my recent past makes me appreciate this experience all the more. I dropped by the artist reception on Sunday—a party after all—and admired the room. The collaboration had its effect, but it was his work, of course, that pleased me most.